The Tenor Saxophone Index is delighted to welcome and present you the first ever comprehensive online repertoire database for original tenor saxophone music. 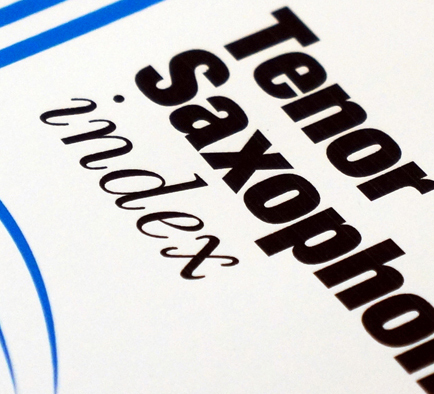 At its heart the Index is a repertoire database providing you all the information you need to help you to perform, purchase and discover a world of 'contemporary classical' tenor saxophone repertoire all in one place. The TSi also proudly presents our very popular Listening Hub designed to bring together and promote original dedicated tenor saxophone recordings from across the world! In July 2015 we debuted our very own ensemble The Tenor Saxophone Collective at a featured event at SaxOpen (World Saxophone Congress) to great success with an european edition at EurSax17! This year the TSC looks forward to presenting a new edition at the World Saxophone Congress in Zagreb July 10 -14 2018! The Index also includes a great resource centre full of interviews, articles and academic papers covering all things tenor saxophone. The Tenor Saxophone Index was put together by a small team of people who all share a passion for tenor saxophone and we are delighted to have two world-class tenor innovators as our patrons in James Houlik and Branford Marsalis. We hope the TSi will become a valuable resource to all saxophonists worldwide, and recommend that you check in regularly as the site and database grows, develops and evolves. Remember to visit & like our facebook page for updates and info on all things tenor saxophone and more.